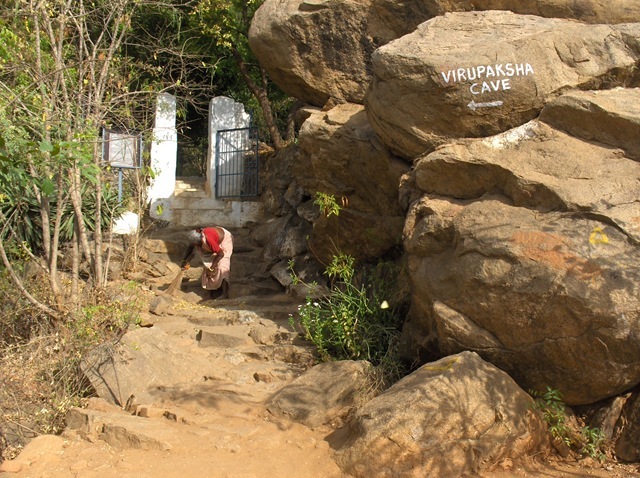 Virupaksha Cave has been venerated since the 1300s, first because of the saint, Virupaksha Deva, then more recently due to Sri Ramana Maharshi. 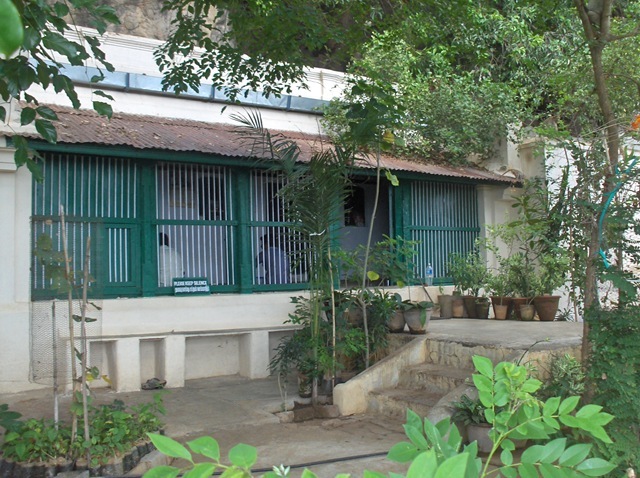 Sri Ramana lived in this cave for 16 years, from 1899 to 1916. It was while residing in this cave that early written works originated like ‘Self-Inquiry’ and ‘Who am I?’. For this reason, many devotees of Sri Ramana feel like this is one location that must be visited. Many find meditation here to be a deep experience. 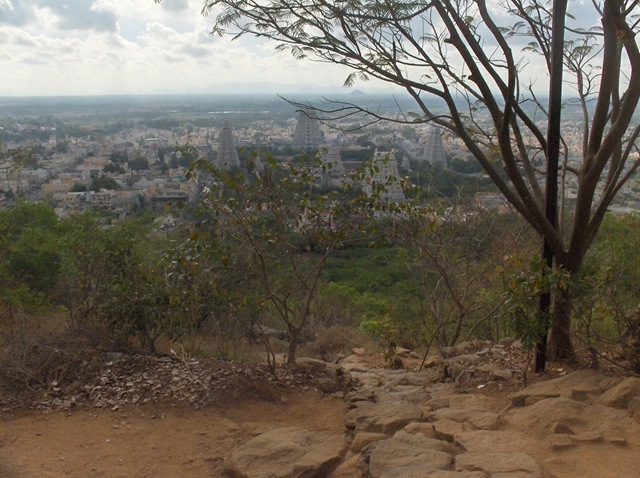 There are two ways to get to Virupaksha: from Sri Ramanasramam via Skandashram, or walking up from the main Tiruvannamalai temple, Arunachaleswara Temple. 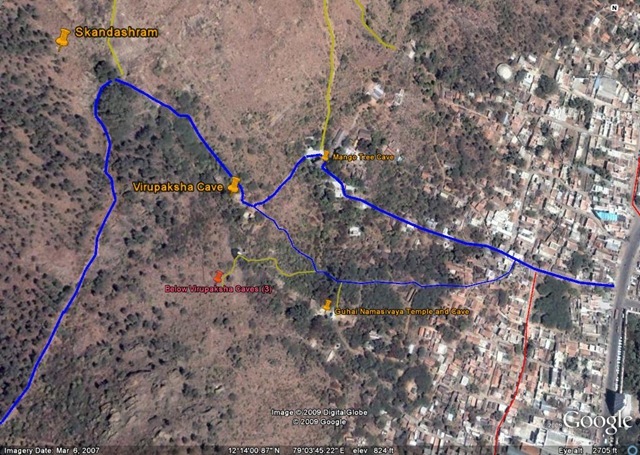 This posting shows the latter, from Arunachaleswara Temple to Virupaksha Cave, and then onto Skandashram. The maps below show the route. 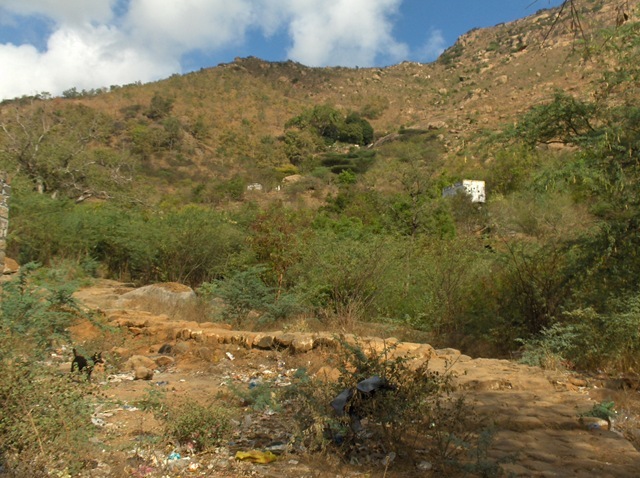 These maps are views from the Google Earth tm maps that I am developing for Arunachala. The first map shows the overall area, from Arunachaleswara Temple to Ramanasramam. 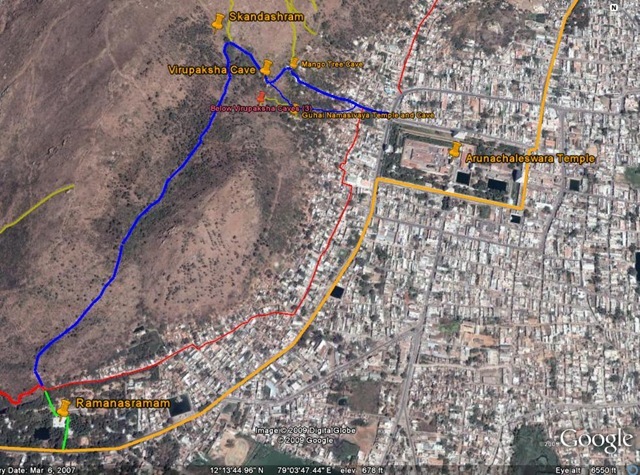 The Outer Path is shown in saffron, the Inner Path in red, the Virupaksha/Skandashram path in blue. 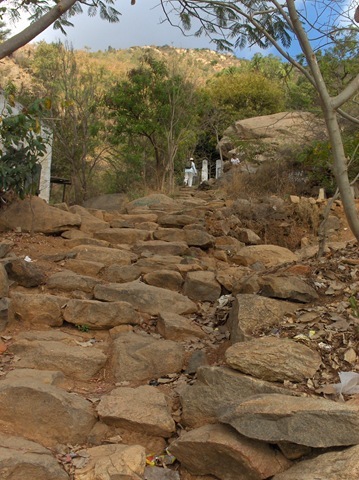 Other paths up Arunachala are also shown, as are various caves, temples and ashrams. Double click (and then zoom in) to see these maps larger in size. Here is a closeup of the area. 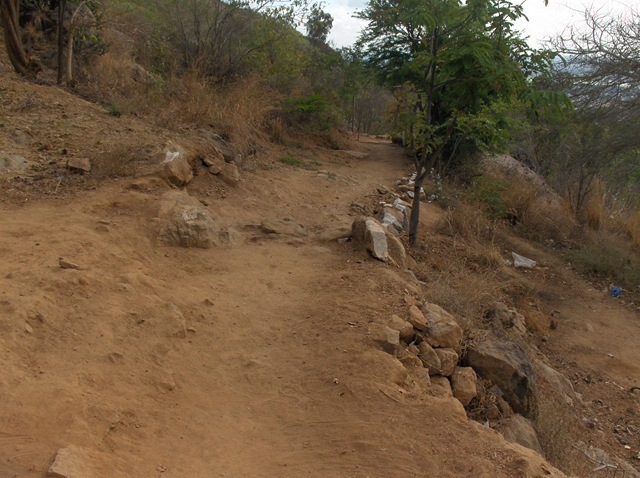 Notice that part way up the hill the path has two possible routes. 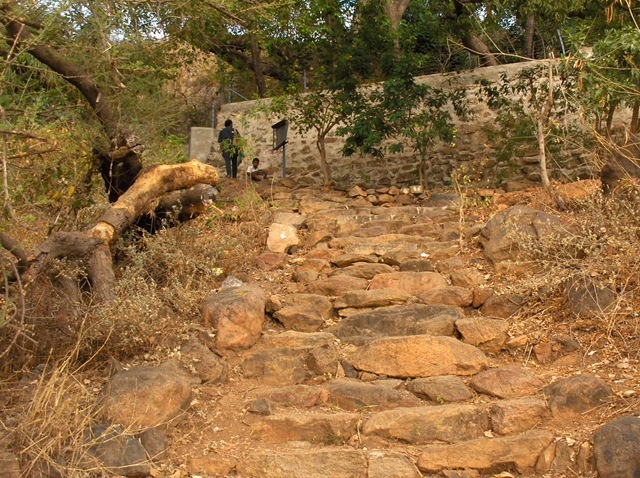 The left route has a long stone stairway built by devotees. We took this route today, and this is what will be seen in the photos that follow. 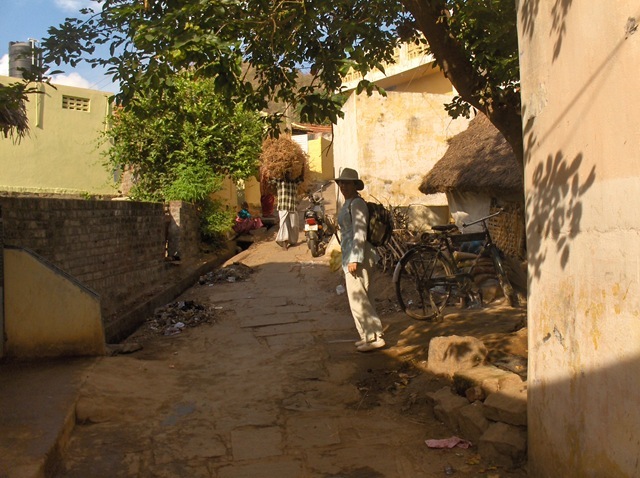 This walk starts on Big Street, on the north side of the big temple. We parked our scooter near Ramanasramam and took a rickshaw. Rajan is standing front of the rickshaw, while Carol is getting out. Valen, who we usually use as a taxi driver, stands to one side. This is a slow season for taxis, and he sometimes rides around with Rajan, I think to have something to do. A bullock cart is by the road. 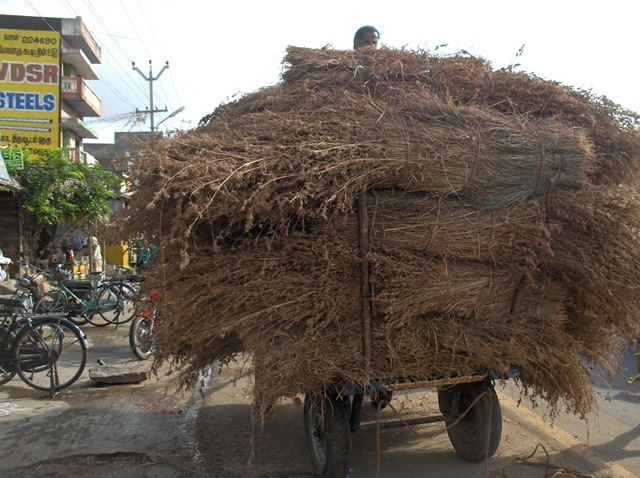 Bundles of long grasses are being carried down the hill and loaded onto it. The path up the hill starts with this road. 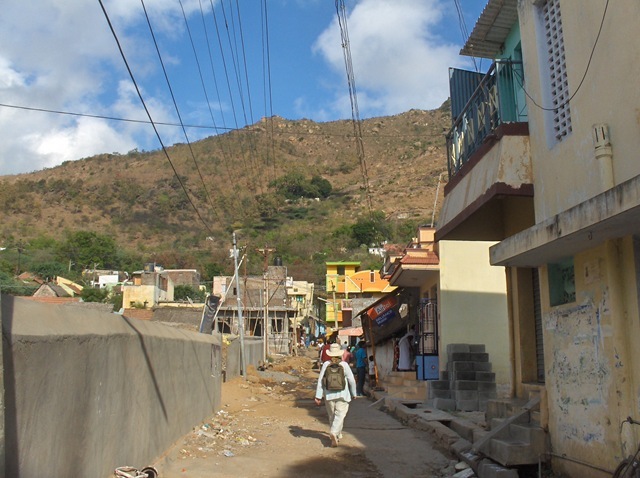 Arunachala is visible in the background. To the left is this wonderfully designed and painted house. There are now many houses with these bright paint jobs. One thing that has made this possible is new long-wearing paints. We’ve heard that the color combinations are assigned as part of the Vaastu system. Vaastu is the Indian equivalent of Feng Shui. Straight ahead the road is dug up and an open trench is in the center. Sewers are being put in. 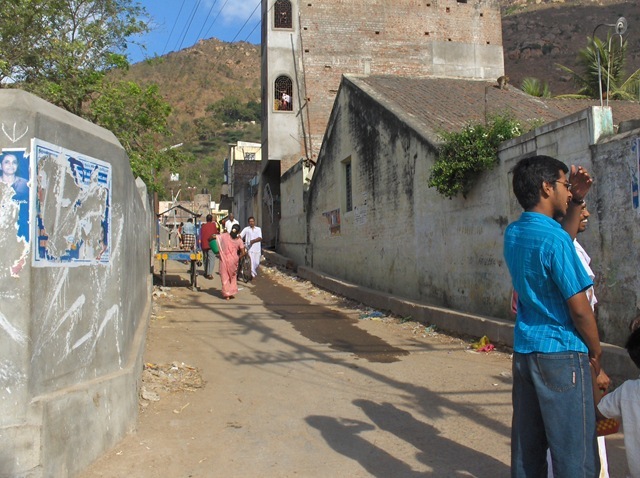 This is taking place all over Tiruvannamalai. In the USA there would be barriers, flashing lights, etc. to keep people from falling in. Here there is just the trench. When they finish the job and fill the trench, the road will be left in a rough condition, until some years from now when it is repaved. About one more block up the hill, we turn left. Notice the sign on the wall of the building. This is the landmark for the turn. The road goes up the hill, past rows of houses. A man carries a bundle of grass down the hill. This girl has a cooking pot, and is playing ‘cooking’ with it. Along the road is this altar made from the truck of a tree. 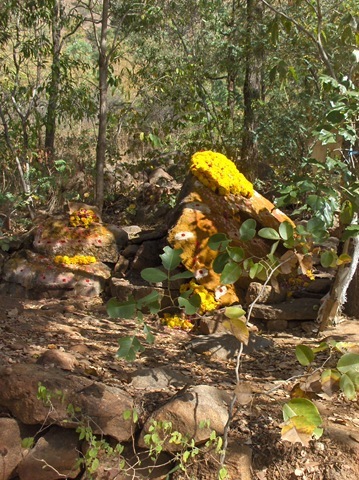 These natural altars are common here, and show the many ways in which spirituality extends through the lives of these people. In the West, religion seems compartmentalized. Here it extends through daily and family life. Now off the road and onto the path. Here there are broad steps. 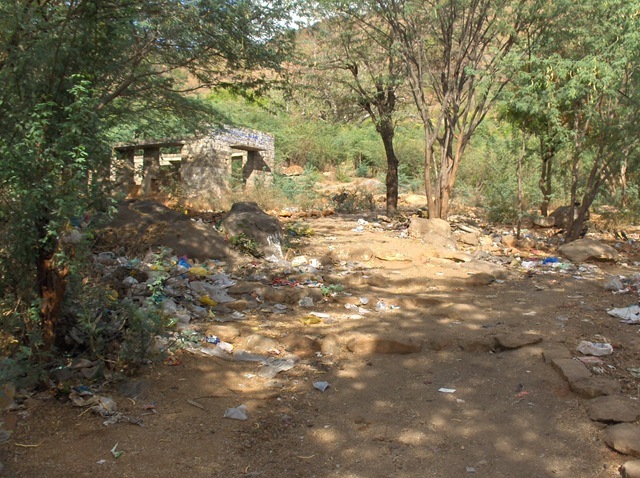 The area is used by locals as a place to dispose of trash and as an outdoor toilet. This is discouraging. A few months back, it was cleaned. The results of the cleaning is shown in this post. The organization that funded the cleaning was not able to keep funding the ongoing work needed to keep it clean. I wonder what can be done to care for this area? It takes more than a one-time effort, it takes ongoing and long-term support. Then maybe the habits of the locals will change. 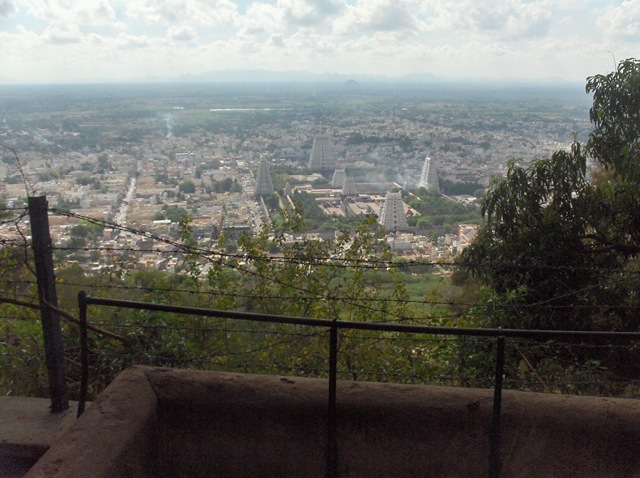 Ahead, up the hill, we can see the Virupaksha area in the center of this photo, and Skandashram with the big green trees above. A nice stone path leads the way. Garbage by the path, a good meal for the crows. Too bad they don’t eat plastic! The paper is burnt, anything edible is eaten, what remains is plastics – mainly plastic bags. Cow manure is precious here. Village people mix it with straw, then make patties to fuel their cooking. Patties are dried in the sun. 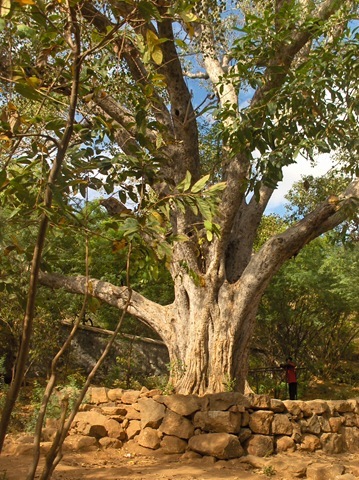 A big tree rises above the path. 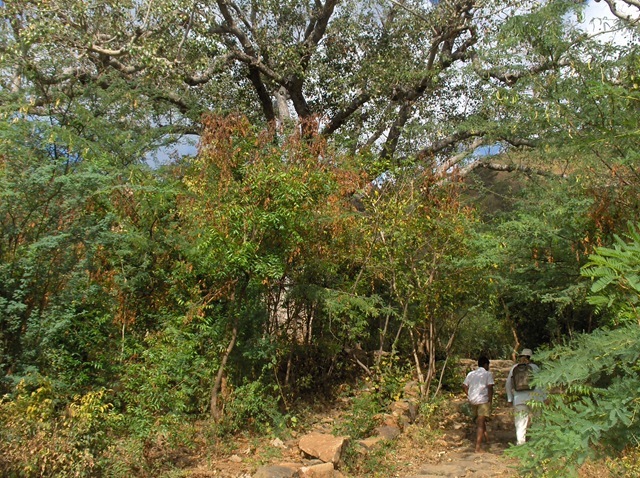 It is a kind of banyan tree, we were told by our friend Hari Prasad, who is a botany teacher at the local college. It is at the center of a pleasant open area. The tree is so big I cannot get it all in a photo. 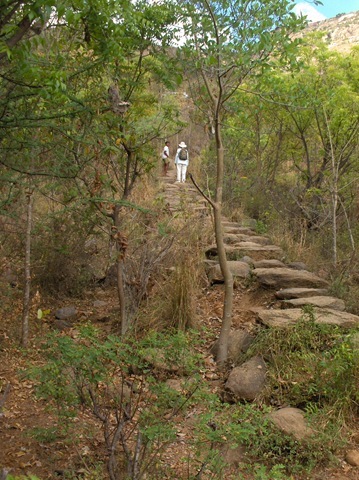 To the left is a path to Guhai Namasivaya Temple. 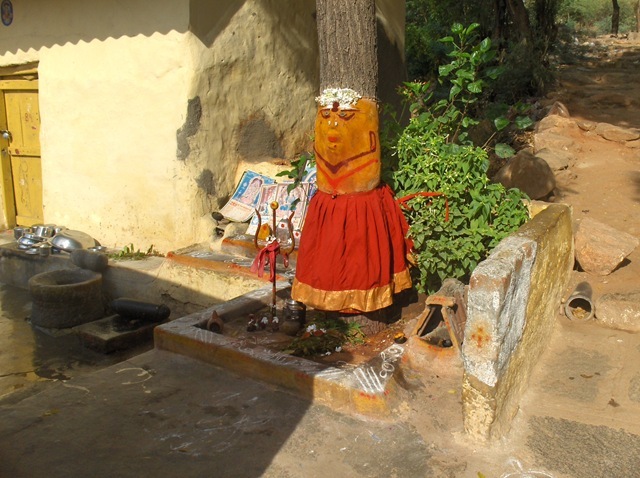 He is a saint, one of many venerated around Arunachala, from the 1500s. There is a good article about him, here. 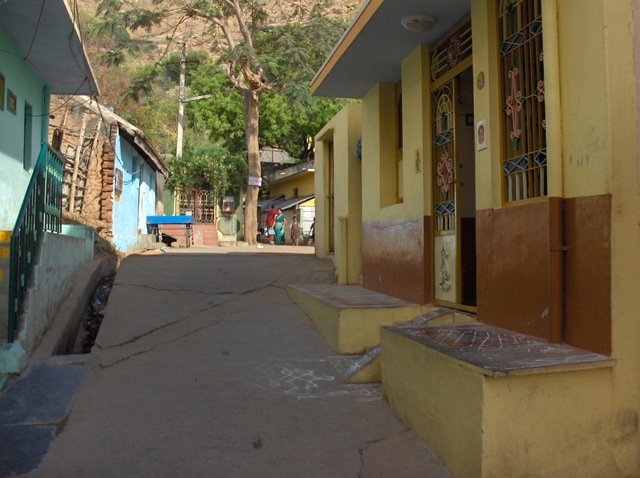 This temple is said to be where Ramana wrote answers to questions on scraps of paper that became the book, ‘Who am I?’. Up the path. Arunachala is above. 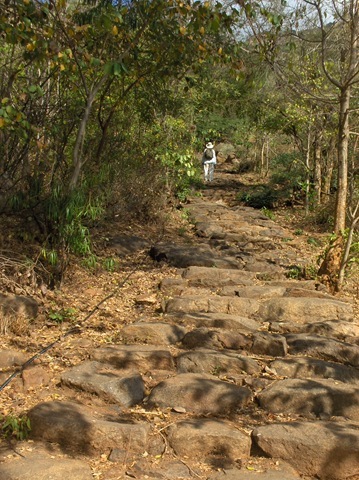 To the left is the path that leads to three little-known caves, described in this post. 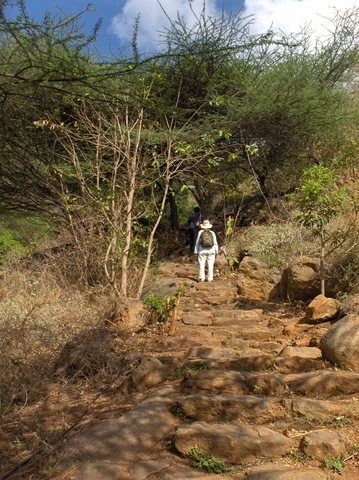 The path continues up the stone steps. It is about 8:30 in the morning. Already the sun is hot on our backs. As we walk, we hear the sounds of chanting from the big temple. This gives the walk a special character. Up we go. In addition to the chanting, one can hear the heavy breathing from the effort of climbing. We are greeted by people coming down the path. Indians will usually ask where we are from, how long we have been here, do we like India, and what is our ‘good name’. Up we go. 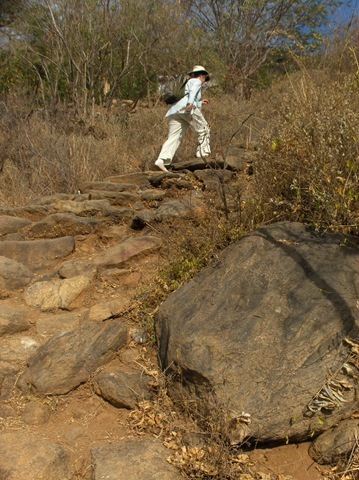 Carol climbs the rock steps. 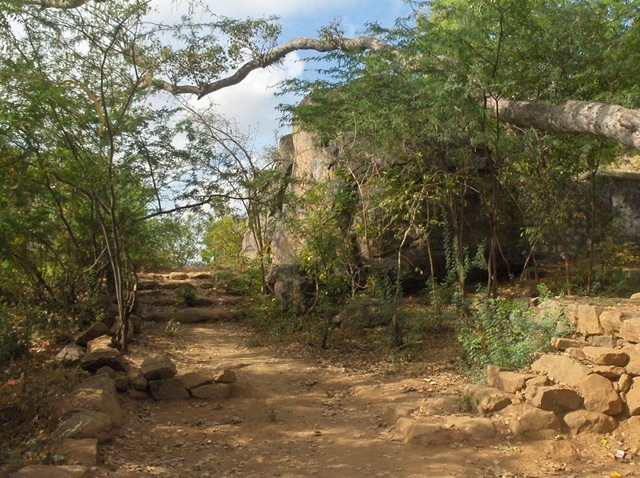 The entrance to Virupaksha cave is visible now. 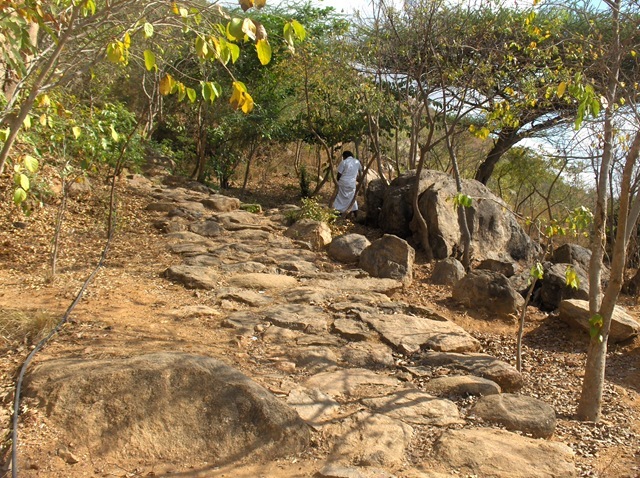 To the right is where the alternate route up to Virupaksha Cave joins this path. 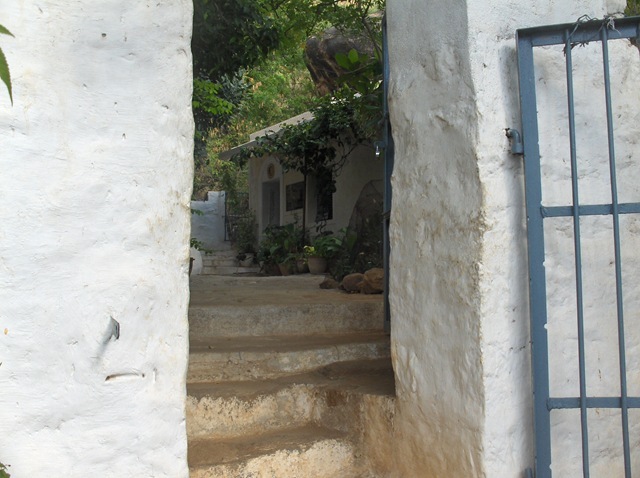 Down the hill is Arunachaleswara Temple. The Virupaksha gate. Virupaksha is opened at 8 AM. A woman is sweeping the steps. 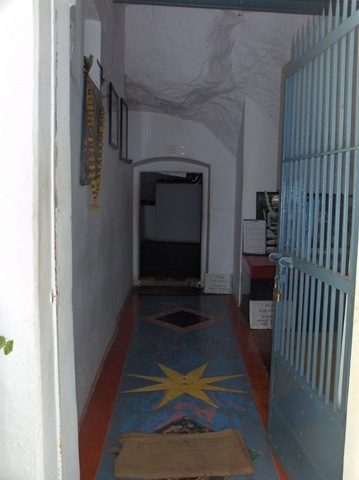 Virupaksha Cave through the gate. 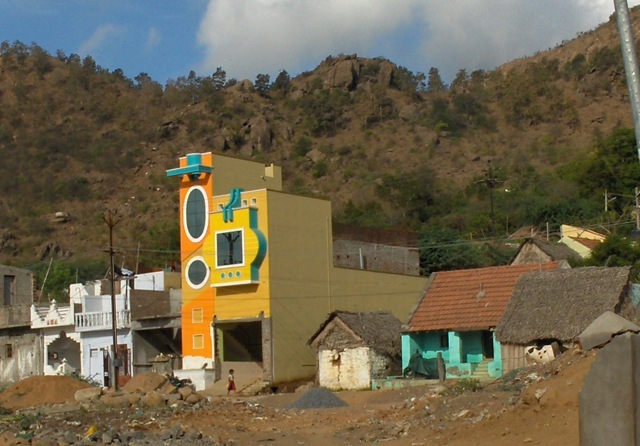 Here is the building now built around Virupaksha Cave. 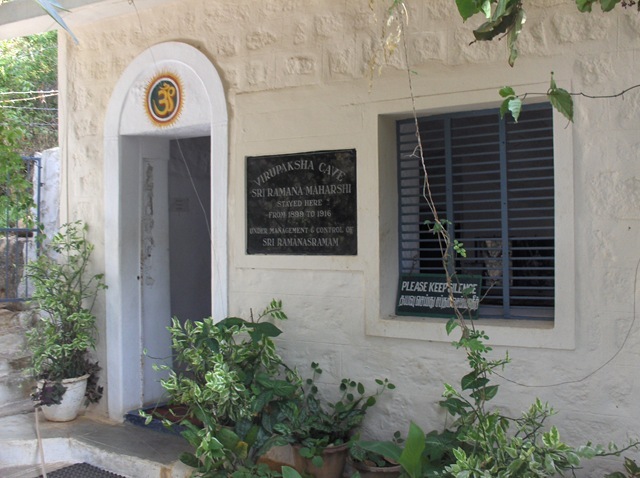 The sign speaks of Ramana living here from 1899 to 1916. We cannot take photos inside the building. Here we look through the entrance, to the entrance of the actual cave. We stopped and meditated in the cave, as we usually do when coming here. Now we have left Virupaksha, and turned left to go up to Skandashram. 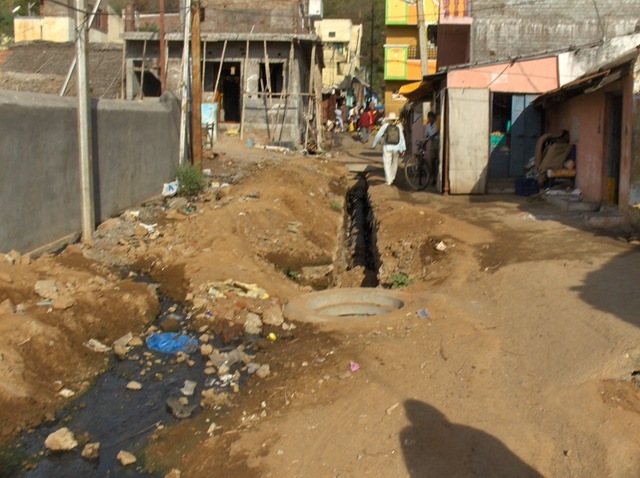 An Indian man stands by the path, peeing. Now up the path again. Up and up and up. A grove of trees is ahead. Any shade is appreciated. Here we take a moment to catch our breath, as does another man walking up today. 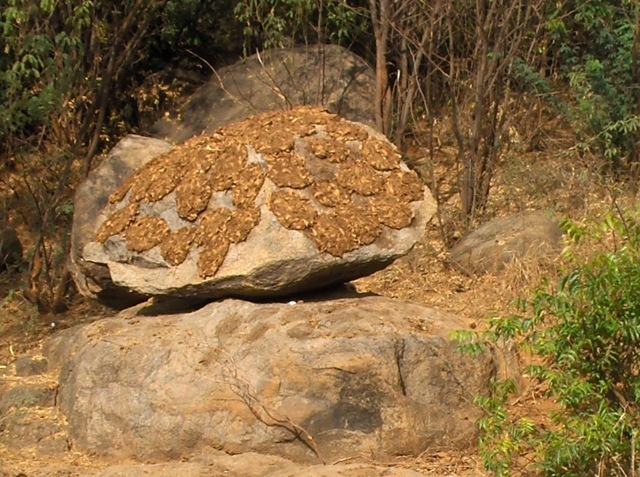 In the rainy season, usually there is water flowing down these rocks. 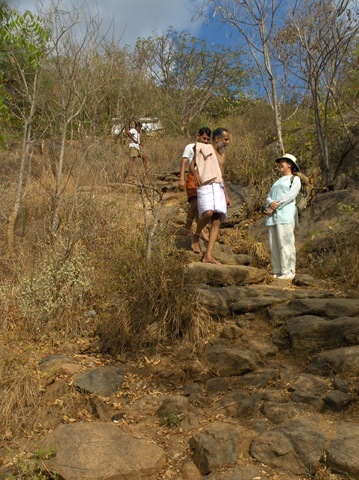 Past the rocks, the last leg of the steps up the hill to Skandashram. 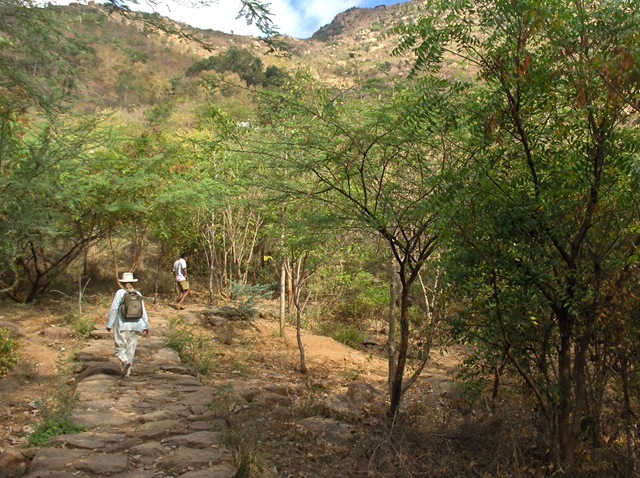 As we enter Skandashram, we are refreshed by the green and shade and pleasant breezes that are usually here. 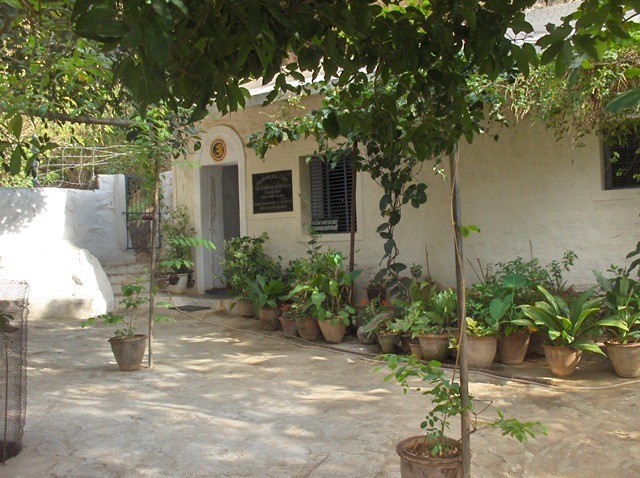 Here is Skandashram. We sit and meditate here for a while. The big temple from Skandashram. This is a famous view, seen again and again in photos. 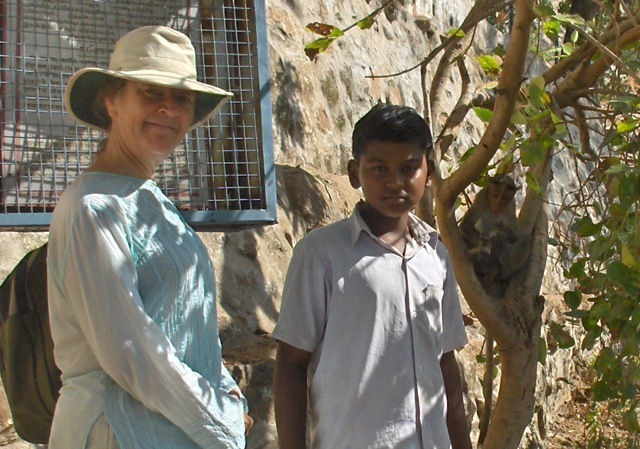 Below are Carol and her friend for the climb, Vigtesh, and a young monkey in a tree. 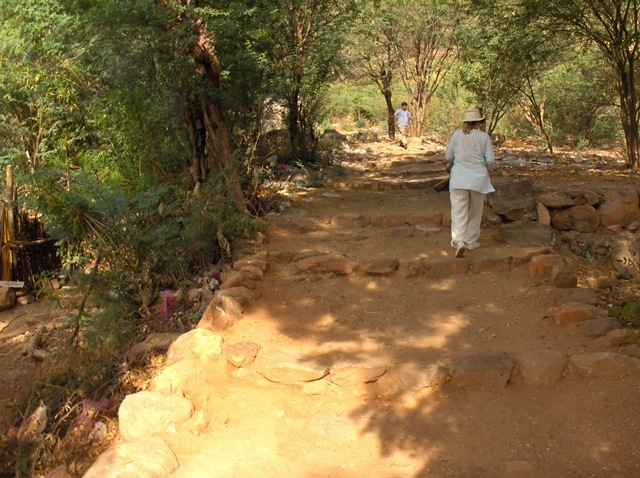 We take the path back down to Ramanasramam. 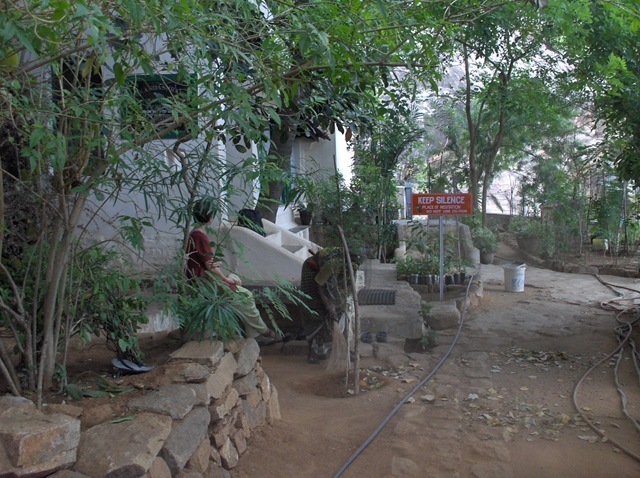 A sadhu who lives on the hill has a group of rocks that he decorates as Arunachala (to the right) and Nandi (to the left). Sometimes they are covered to protect them from the elements. Today they are uncovered, so we can photograph them. 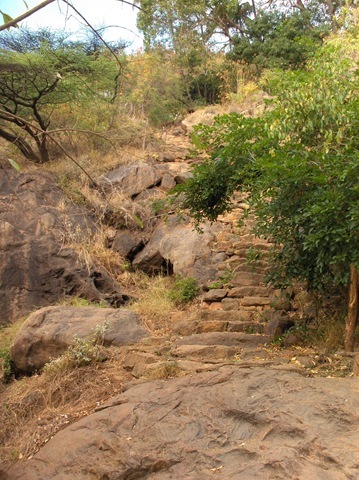 The climbs to Virupaksha Cave and Skandashram are among the most popular activities for Ramana devotees. These are both wonderful places to visit and in which to meditate. We come here often, once or twice most weeks. 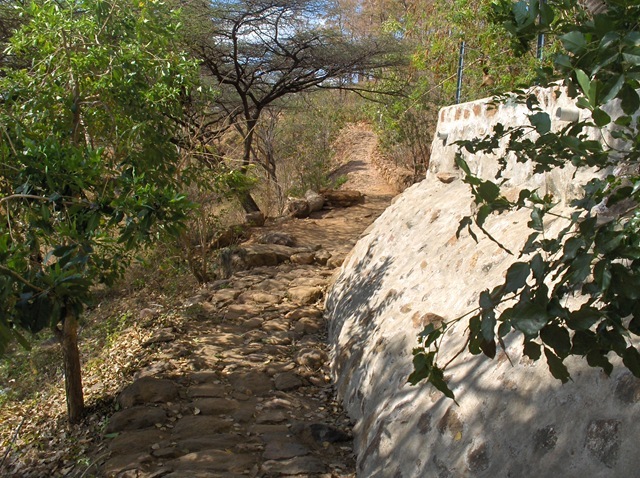 Right now we take the steepest route we can find (shown in these photos). 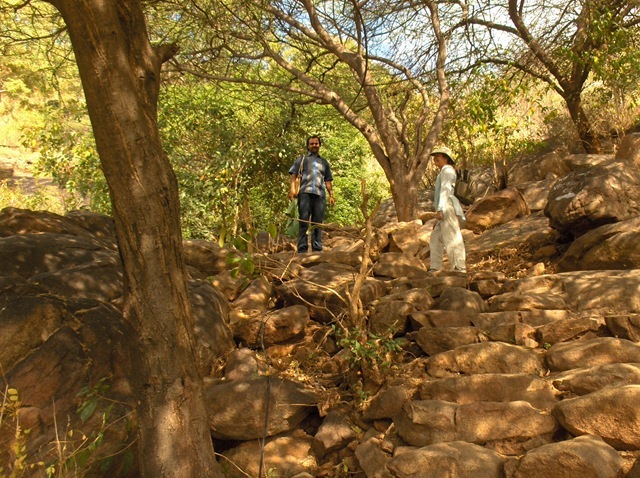 We are trying to get stronger in climbing, so we can someday get all the way to the top of Arunachala. The other way to get to these sites is to start from Ramanasramam. 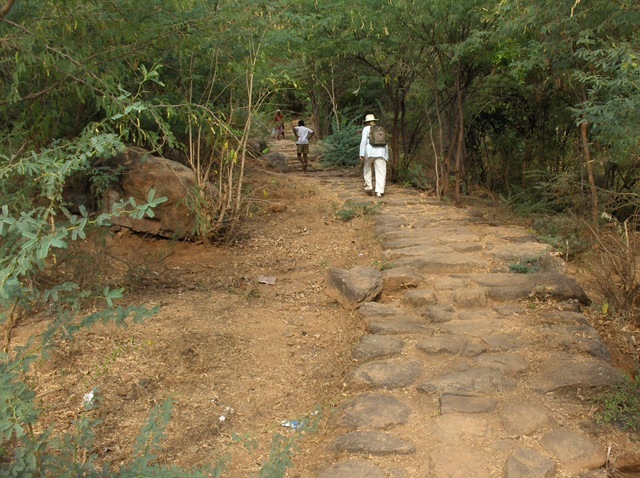 This is shown in the post, Walking to Skandashram. If you support this work, donations would be appreciated. 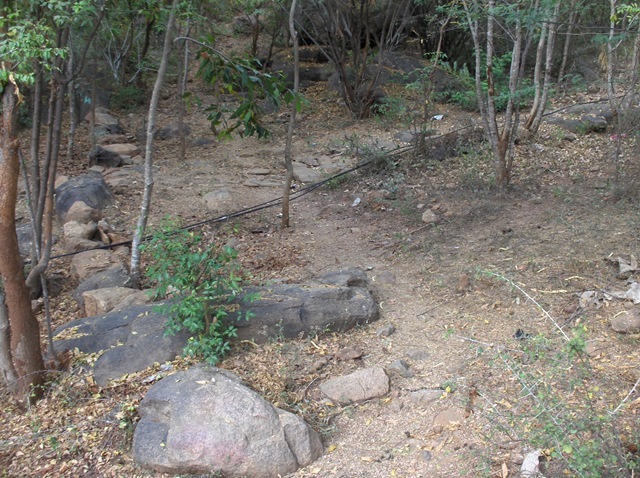 This entry was posted on April 10, 2009 at 9:53 am and is filed under Arunachala, Ramana Maharshi, Spirituality, Tamil Nadu, Temples, Shrines and Ashrams, Tiruvannamalai. You can follow any responses to this entry through the RSS 2.0 feed. You can leave a response, or trackback from your own site. It has been a wonderful experience to read this. I am feeling the grace of Ramana flowing. when I am reading this. The grace is always there, as you are open to it. 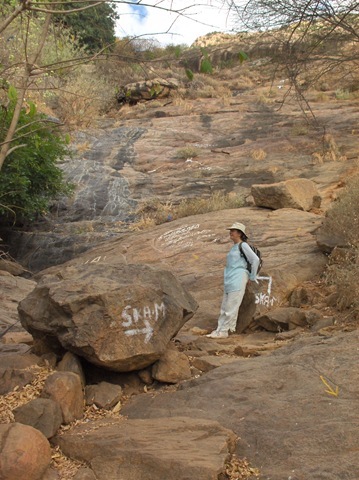 Thank you, You provided wonderful information, How much time we need to walk to reach Virupaksha Cave? From Rananasramam? Give yourself one hour. Less if young and fit. 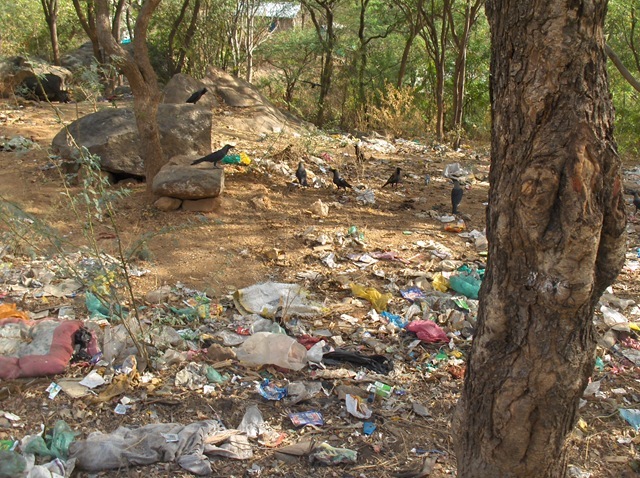 Very disheartening to see the plastic, waste being dumped on the hills, in the path way, people peeing, etc. When will we ever understand the preciousness of these places and preserve them? 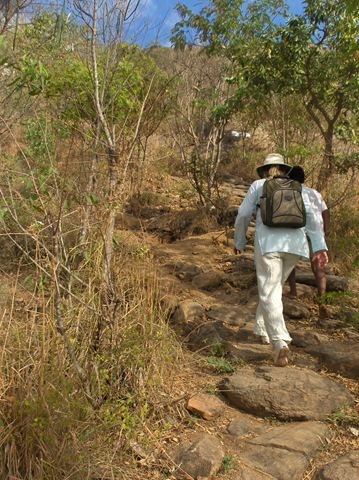 Once lost, can we every get back an Arunachala or a Maharishi? Tragic that the state government that makes crores and crores of money from Hindu temples is only interested in the loot of temples and not in protecting and maintaining them. Agree. These places are precious and at rick. And the government seems to be not fulfilling its appropriate role in creating solutions. What can Indians do to make this different? The government does not listen to foreigners. I really wonder about your height of devotion regarding Ramana Maharshi. 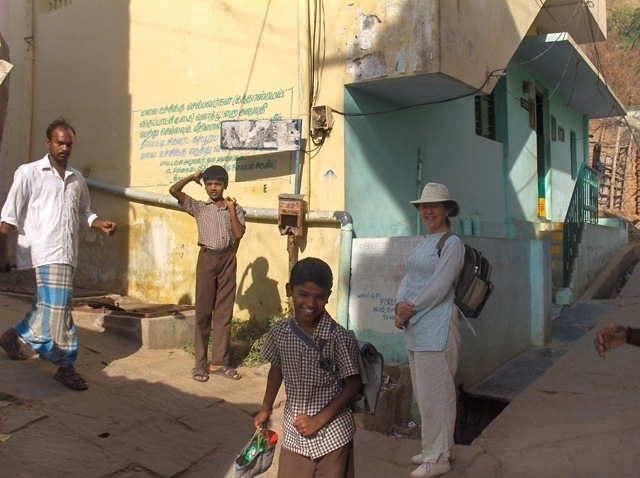 We love Ramana, Arunachala, and the Self. Are they any different?